Traditionally, generating new leads has been a central focus of marketers at mid-sized B2B companies. However, more companies are shifting their focus from quantity to quality, and spending more time nurturing existing contacts than acquiring new ones. 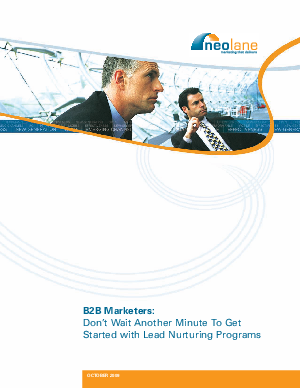 This white paper outlines how B2B marketers can build the foundation for their own lead nurturing programs to increase campaign effectiveness, maintain the interest of prospects through the entire sales cycle, and deliver automated time- and event-triggered inbound and outbound programs.